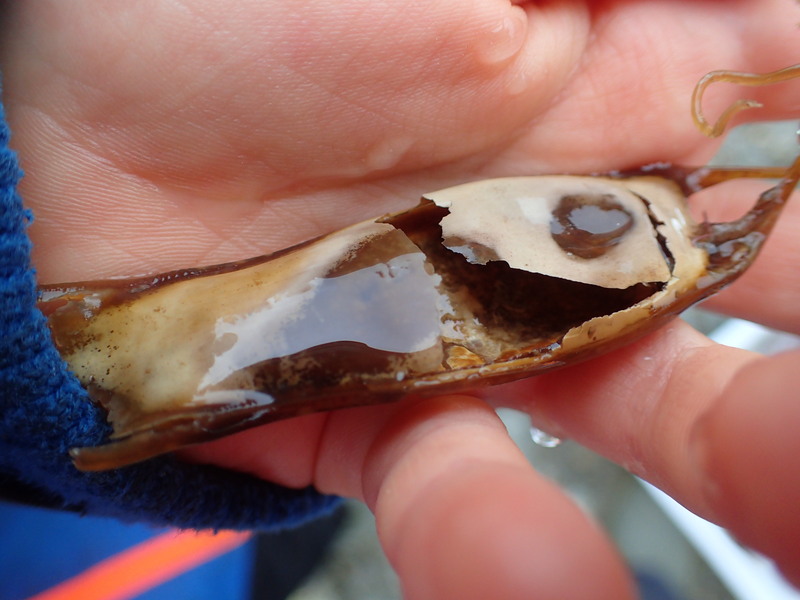 There’s a chill in the air and the pools are strewn with orange and yellow oak leaves, blown in from the nearby woods, yet there’s a crowd on the beach for the Looe Marine Conservation Group’s half-term rockpool ramble. It’s nearly Halloween and there’s no better way than this to get close to other-worldly creatures with some revolting habits. We arrive late and everyone’s already gathered around the shore lab trays, sharing their discoveries. I’m called on straight away to identify a lugworm, its dark slimy body is oozing into a corner of the tray. You’d only have to blow it up to human size to have a classic horror movie monster. Next up is an empty egg case and several keen kids at the front shoot their hands up and jump eagerly. “It’s a shark!” they call out. Lots of guesses follow about what species of man-eater might be lurking in the shallows. This case is actually from a lesser-spotted catshark, also known as a dogfish, which has some impressive teeth and grows to around 75cm, but is shy and harmless. The rock poolers have gathered an impressive haul of starfish. There are cushion stars, a common starfish, brittle stars and a spiny starfish so large it occupies most of the tray on its own. 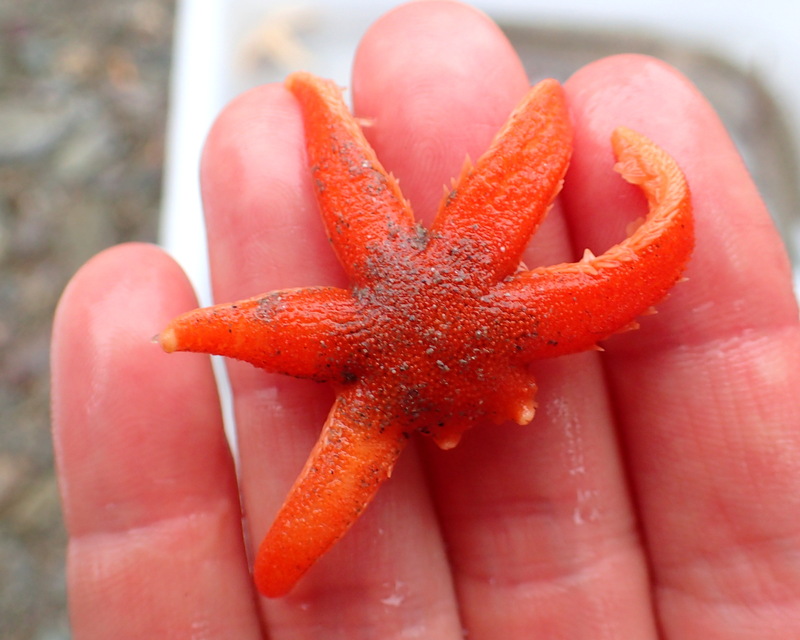 We look closely and a stunning little starfish with a pumpkin-orange back. At first glance it appears to have five arms like the others, but on closer inspection we see two stumps. This is a seven-armed starfish and these bumps are budding new legs. Just like in all good horror flicks, these creatures can re-grow their limbs. The crabs are on fine form, claws raised and closing on each other. Left to their own devices they’d soon eat each other. Prawns lurk close by, sensing trouble and always willing to clean up any crime scene. A Xantho pilipes crab shows off her killer claws and hairy legs. Many of the inhabitants of our pools, like the scorpion fish with its fierce spines and puffed face, would audition well for a horror film part, but each of these creatures is perfectly adapted to survive in this harsh environment. After the crowds have left, we carry on exploring the pools, wading among red sea beech and finding bright anemones among the fading sargassum weed. 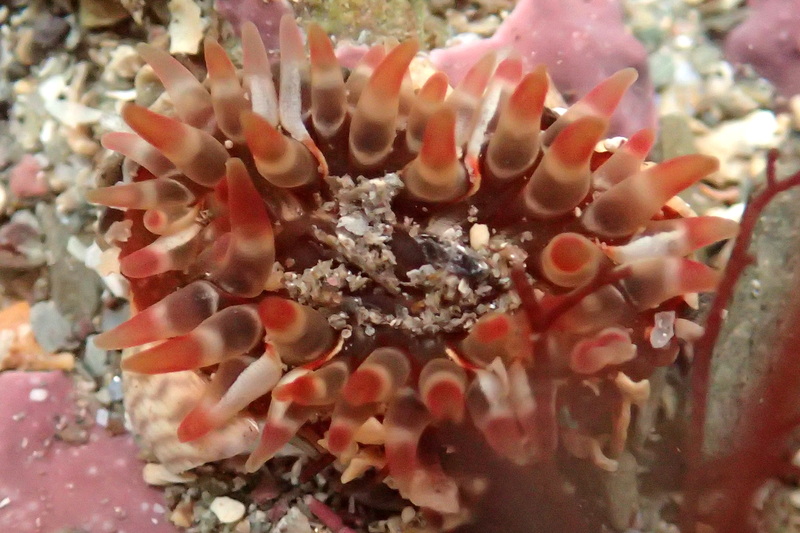 A young dahlia anemone adding some autumn colour to a rock pool. Late October is a time of calm in the Cornish rock pools. This is the end of one year of growth and the transition to the next; the old Cornish festival of Allantide (Kalan Gwav) celebrates the first day of winter at this time. Our wildlife will weather many storms before the next spring comes around. What a lovely end-of-season report on our fascinating and colourful rock pools. 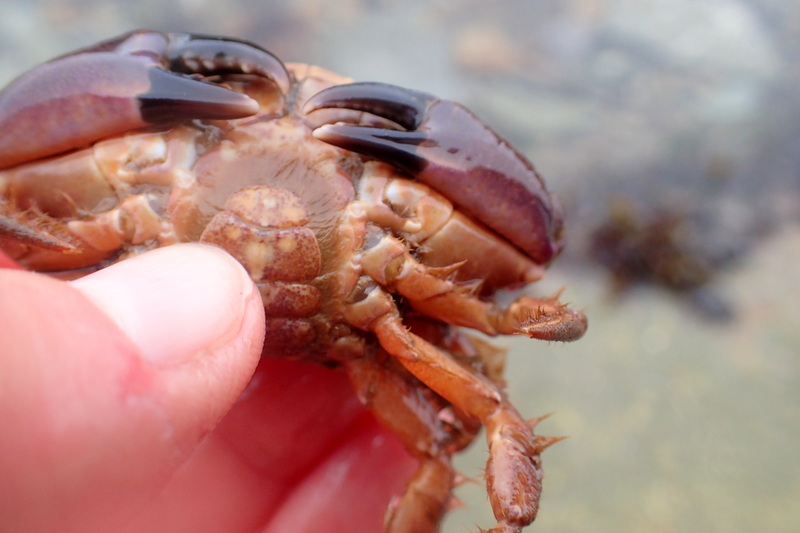 Good luck to the creatures out there who will be weathering the storms this winter; no doubt Heather and the family team at Cornish Rock Pools will continue to keep us posted with amazing insights into life just below the water…thank you team for another great year on life on the shore! Thank you so much for your lovely comments Karen. I’m glad you’re enjoying the posts. A lot of the rock pool animals look very fragile so it always amazes me that they can withstand the winter gales and waves. We’ll be out on the shore over the winter, checking up on how the animals are faring, searching for interesting things that get washed in and looking out for those first signs of spring. 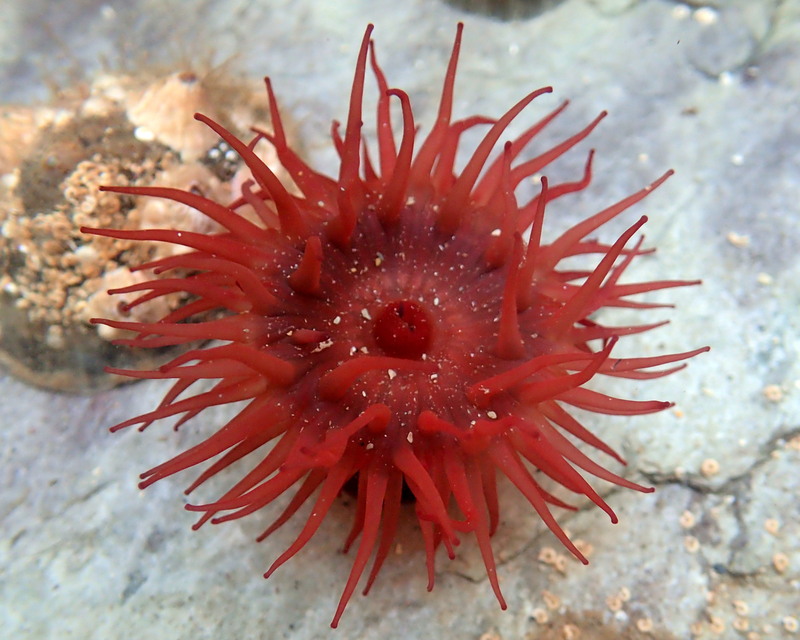 I hope you’ll join me for a rockpooling trip once the chilblain season is over!